Oh yeah, George and myself are down here at SoELive 2013, where we are having a blast, and tired from the trip. Getting together with gamers, either pen-and-paper or MMO is always a cool thing, and sharing ideas and creativity is always cool. You can feel the excitement rising here, with Friday's EQNext premiere and a whole host of seminars coming up that will take us through the weekend. There is a ton the experience and learn, everything from how to manage an MMO to setting up a successful Youtube channel, creating MMO quests, and a bunch of other very cool stuff that has lots of applications to the pen-and-paper world. A Couple Pages Beyond "The End"
The game fell off into the abyss. It felt like trying to continue a story off in the blank pages beyond "the end" in a novel. Yes, I had done a little prep work, but I knew of the place they were going to, I had a rough idea of the map, some general ideas of the difficulties of getting there, along with some adventure hooks they could pick up. But the overwhelming feeling of 'you've escaped, now what?' hit the both of us, and there was no compelling reason to play. You've won, you've escaped, you did it - roll credits and play the cool music. Now if the story was like some of our earlier play thoughs, it would have been different. In earlier games, we had larger meta-games we ran on top of the rules, where how you ran your group of adventurers mattered, and you actually had to go out and recruit to meet your party's needs. This game was purely story, and once that was accomplished, anything else felt like it couldn't compare. We thought we were setting up a larger system to play something beyond the roles, but in the end, it didn't work out, and we ended up completing a one-shot. Did we have support for the larger meta-game? To be honest, no, we didn't. We envisioned the captured players to be a part of a Game of Thrones sort of conflict, with noble houses, lands under siege, infighting with royals and villains, and all sorts of other cool stuff going on. We don't have the meta-game rules for that sort of conflict, and honestly, this sort of thing seems better suited for a dedicated world-book where you can take the time, design a world around it, and do it right. It is an interesting problem, and one with our background of SBRPG, one we are better suited at to solve. Many pen-and-paper games are happy with providing a set of generic dungeon or conflict resolution rules, and it typically takes them 600+ pages to get that done. Yes, we did that as well with SBRPG1, a RPG the size of a phone-book. The new thinking is a thin-and-light game 'client' and then support the game with dedicated world-books that have larger meta-games to play with the rules. Manage a kingdom, play a private eye, be a space merchant - the world-books are the place this happens and where the meta-game is laid out. SBRPG's meta-game was the faction system, and this is a core piece of the base game we want to preserve and enhance. However, the world-specific meta-games is where the fun and addiction happens; and with a referee involved, things become unpredictable and insanely fun. Many pen-and-paper games fall off the abyss because they don't do anything beyond just 'replay a story' like a DVD player. Try and go outside that box, or off of that DVD, and the referee has to start improvising more and more. Pretty soon, you run out of improvisation, especially if your source material was limited. If you have rich source material, such as the entire Star Wars galaxy, you can possibly never run out of improvisational material (Hollywood does not apply to this, they reboot far too frequently). Start with just an idea, such as 'escape from the evil kingdom' and you will run out quickly. Hence the abyss. What do you do when your game goes into the abyss? You re-tool, figure out 'what is this game about?' and focus the game back onto the core idea. For ours, it was escaped nobles and the revenge upon the bad guys. We will probably have to shelve this game and get back to it when we have a world-book and meta-game to support this. Otherwise, it will be 100% improvised content, with no real 'game' behind the action to say 'what comes next?' Of course, the referee is always there to say 'what happens next' but the referee shouldn't have to do everything - there needs to be that game behind the game that makes things interesting, that surprises even the referee, and that players can become good at and focus on, no matter what is happening on the roleplaying side of things at the moment. One of the areas of most roleplaying games that makes we wonder is the design of epic-level characters. These are typically high-level characters in the last 25% of the game's progression path. These are the earth-shaking superheroes of the world, iconic characters in their own right, and ideally, what players strive for their characters to become. Too often, game designers are content to just let high-level characters to be broken, the rules not tested or designed for high-level play, or they let the game's math drift off into this area where the number ranges are so high the original dice mean little. What's the point of rolling 1d20+30, when most tasks in the game are 'beat a 20-25'? D&D4 was notoriously playtested less than it should have at the higher levels, the game fell victim to multiple cheats, stun locks, and other cheeseball tactics that spawned endless errata. Our group hit multiple issues with high-level balance, some classes falling off the power curve, and changes invalidating builds far too often, and it hurt our group's interest in the game. To be fair, the game was designed to have high-level play, the rules and monsters support it - it just wasn't playtested that well. The fact they needed to re-balance monsters constantly tells you something, they never found that sweet spot in play until the game's end. Most of the 3.x D&D games, including Pathfinder, cease to be fun after level 7-8 or so, and a lot of players in our groups shared that view. The games devolve into abstract high-level math, and around this point, wizards and other spell casters take over the game, so the pure fighting class players lose interest first, followed by the caster players later on. The game just wasn't designed for high-level play, and extending the system just leads to an escalation of numbers to the point of absurdity. The old D&D 3.x Epic Level Handbook has skills and modifiers shooting all the way up to 1d20+100, and at that point, you are so far out of your original dice range things get silly. Some of the old percentile games never scaled well either, games like Top Secret and Star Frontiers had percentile ability scores that were hard to figure out when they got into epic ranges. In Star Frontiers, if a robot has a strength of 500%, his melee skills would be something like 250% + 10% times skill level of 1 to 6. How does rolling a 205% chance to hit work? Similarly, characters could have scores of 110%, 130%, or more with some experience expenditure focused on one area. MMOs hit this problem with no end in sight. In World of Warcraft, you could have a 60th level character doing hundreds of points of damage per hit, and then a 90th level character doing tens of thousands of points of damage in a single hit. Compare this to a first level character doing 1-10 points per hit and you'll get a good sense of scale. Some day, we will have DPS ratings being calculated in the millions of points of damage in a single hit. There comes a point where everything becomes relative, and the numbers matter little. In a way, this hasn't changed much from the old SNES RPG days where a character takes 9999 damage, the maximum they support, and dies - although the numbers have gotten much larger. Okay, yeah, complaining is nice, but what do you do about it? A lot of these games do not understand that high level play should be different than low level play - and not just by the size of the numbers. There comes a point in every game where the game needs to change, and the game could change again at another point. World of Warcraft used to understand this, and in some games like Everquest, it still applies. In these games, certain classes have game-changing powers unlocked at certain levels, and the class' role changes. Where MMOs fail in this is that the gameplay does not change. typically, it is another dungeon with slightly more powerful monsters - maybe some new special powers are used on your group. A game needs to know the breakpoints where the game changes, and support this. D&D4 tried to do this with tiers of play, where they tried to set expectations of what characters at different tiers of play should be doing and going. It led to a strange situation where 10th level characters were out plane-hopping, and this hurt the dedicated worlds, such as Eberron, Dark Sun, and Faerun. The game did set expectations well, but in reality, it didn't really do too much more than offer some special tier classes and more powerful monsters. The math has to work too, and you have to set caps you can live with. If you have a game based on a 2d6 skill roll, what does it mean to have a +10 modifier? Epic doesn't have to mean broken math, especially when you take the time to design that high level experience. It is a different thing if you intend your game to break at high levels, that is a different thing, and also something we used for SBRPG1. An open-ended game where the math will break is a different beast than a close-ended game where the math breaks at the high levels. In the latter, the designers should have tweaked that high-level play experience to b fun without broken and strange math. A lot to think about today, and also issues we are hitting in the design of 7dRPG. Will D&D Ever be Anything More? Now, some of these are taken from public-domain fantasy, others cribbed from copyrighted sources with the names changed, and still others are WoTC copyrighted material. If you can't find it in the old 3.x SRD, chances are it's "product identity" and copyrighted by someone, likely WoTC. All these items, spells, monsters, and the way things work are "D&D", and D&D does D&D well. For the most part. Depends on the edition, and what you think D&D is, of course. Some people may say Pathfinder or Labyrinth Lord looks more like D&D to them, yet others think World of Warcraft fits their idea of D&D, and more power to them. In these cases D&D becomes synonymous with 'fantasy gaming' and you get a butter/margarine replacement system going on. People that are immersed in World of Warcraft don't care that there are no drow or beholders in the game, there is plenty of other cool stuff to replace those iconic monsters and races. So the central question comes up, will D&D be anything more? Well, a big part of this depends on why you are asking the question. If you are happy with whatever your idea of D&D is, great, the question does not need to be asked. It's like having a slightly older smartphone that still works great, and you feel no need to upgrade to the newest thing. To you, that old smartphone fits your definition of what a phone should be, and you are happy. Of course, the phone companies and manufacturers probably dislike you for not spending money and upgrading, but that is another question entirely. If you aren't happy with any idea of what D&D is currently, then the question becomes important. If your shelf is sagging under Pathfinder books, your 4th Edition D&D books are under-supported and errata-ed up, and there isn't interesting in playing a retro-clone; the question probably doesn't even matter to you anymore. You can literally walk away, play a fantasy MMO, and find people to play with a lot easier and without the constant stream of books and rules systems you have to learn, support, and store. In the smartphone market, it's like saying 'I don't need a smartphone' and just going back to a cheaper flip phone, saving your money, and opting out of the ecosystem. again, not a place the phone industry wants you to be, but at least it is still a valid choice. D&D ultimately depends on what the creators put into it, and how they can make the game seem compelling again. I say 'seem' because what D&D is probably won't change much from it's roots, and by all signs, the 4E experiment is over. D&D needs to overcome 'I've played with that stuff already' and make itself fresh and relevant again. From the current set of releases, rehashing the old modules and patching them to play with D&D Next, I feel it's a lot like emulating classic C64 and Atari 2600 games, and expecting them to set the world on fire. It's great that the old stuff is available again, but it doesn't answer the question of 'why this is relevant?' In a world looking for the next World of Warcraft, why is Atari 2600 Asteroids cool again, other than for nostalgia? Yeah, a big question today, but one worth asking if you love the game. The game, in its heart, is all the cool stuff that lives and breathes in the D&D universe. Less so the rules, as 4E proved, although somewhat messily. Bringing the cool stuff together is way more important than rules, and creating that shared experience is what I am a fan of. To make D&D something more, it has to breathe again and live. World of Warcraft should not be good enough to replace the core experience of D&D. How will that play out with D&D Next? I have no idea, honestly. Is the question important to me? Honestly, yes, but there is a big but in there. I can get my D&D-like hit from other games and rules systems; and the stuff you can't replace, the D&D iconic things, aren't as important to my gaming life as much as they used to be. Pathfinder proved you can be D&D without most of the D&D iconic things. The challenge for WoTC is make these things unique to the core D&D experience mean something again. All this comes up as I sit her looking at my old smartphone, wondering if it's worth upgrading it, or falling back to an old one. Good enough, do I need a new one, or fall back? Which choice enriches my life the most? The question is half my choice, and half of what the smartphone companies can offer me. If nothing new can be offered, staying put is a valid and wise choice. Flashy ads don't cut it, either, a new phone has to bring something new and exciting to the table - just like a new roleplaying game. I was writing through the search rules of 7dRPG the other day, and wondered about the role of searching in role playing games. Now searching is such a common activity, I think it's second only to combat, that is deserves a little attention and thought. First off, what does searching do? "I search the hall ahead for traps." "I search the treasure for traps." "I search the door for traps." "I search the room for traps." "We search the monsters for treasure." "We search the room for treasure." "I look ahead for ambushers." "I search the [object] for [thing]." These are all such common searches that they have almost become punctuation-like in their application in roleplaying games. They are essentially, gotchas, inviting the referee to surprise the party whenever the party doesn't search for something ahead of time. Thus, the party gets burned, and they start ad-nausea searching everything in their path, every 10' square of hallway, every door and lock, every tapestry and dungeon furnishing, and especially anything a referee mentions in a description. I like the possibility of one-check binary failure at tasks, you make your skill roll, you fail at picking the lock, and now you must find another way around. Rolling until you do it is munchkin-ism at heart, and assumes the system you are playing with has no 'repeated attempts' penalty. Ta20 is now a reflexive reaction to a skill roll where time is not a factor, and it slows down the pacing of a game. In situations where repeated rolls are allowed, I like subsequent attempt penalties, since they simulate the looming specter of failure, and puts a premium on raising your skills in the first place. The points you put into skills should matter, and allowing infinite repeats devalues that. Binary failure is important! That d20 roll is 'your chance at making it' in the universe, and the roll you make is 'your one shot' - it is that way in combat. Roll bad, and fate does not smile upon you, and you miss the blow, fail the task, and blow it. It's this way in games like Arkham Horror, if your investigator fails a skill check called for on a card, it fails, and you take the negative result and move on. If the skill check is to get past a door that you must absolutely get through, well, either the referee must wing it, the adventure was poorly designed, or the party needs to think of another course of action. Back to search. D&D4's 'passive search' comes in play now, basically, this is an 'always on' rule that assumes characters are walking along an always 'taking a 10' at every moment of their existence. Any search task with a DC below a character's passive search rating is auto-found without a roll. This eliminates the need for always rolling search rolls every step of the way, and in d20's search paranoid world, is a huge improvement and time saver. The origins of this rule are the same as Ta20, because it assumes characters are forever alert and in a Ta10 state. Why do we assume the natural state of things is an 'average roll' of 10? Can I assume this in combat? Again, humans love to put order on chaos, and assuming an average roll as the natural state attempts to put some order on the nasty flat-distribution of the d20 die. There always has to be that wild chance of failure, that chance to roll a "1" and totally miss the obvious, and the elimination of the mathematical statistical ruination of the game. This is not a statistics course, this is a RPG, and your scores and skills matter the 'moment they are called upon.' If your Dwarf in that moment of need rolls a "4" and blows it, he blows it, let's handle the negative consequences and move on. Besides, there is no such thing as an "average roll" with a sample size of one on a flat distribution. Ta10 on a single event, like a search roll of spotting something, is a statistical fallacy, since there would be no average roll on that single event. Back to Rolling Everything Again? Without Ta20 and passive search, where are we? Obviously, back to rolling everything again. Yes, searching uncovers huge design flaws in roleplaying games, and especially in classic 'dungeon crawl' fantasy. But I can say paranoid searching in dungeon crawls is part of the fun, and in earlier D&D games, there was no search skill - if you as the player were smart enough to say what you were looking for and where, you found it. The thief's "find traps" skill was always a bit of a genre-break for old-school games anyways, since realistically, everyone searched using the verbal method. The answer I feel is to eliminate the need for endless searches in these games, and make searching one of those 'special events' again. With a search skill, you will need to aggregate things a lot, one roll to search a room or group of monsters for loot, and then say what you found based on success. One roll on an entire hallway for the party's scout to see if traps or ambushes are found. One roll to check out a room to check for hidden items, secret doors, or other concealed loot. Do not roll for the obvious, and only require a roll for the special. If it has a chance of forking the plot, revealing a danger, or giving out a reward - roll. While you're at it, support the old-school 'investigative play' method whenever you can. If a character pulls the drawer out, and the player is smart enough to have the character check the bottom of the drawer for an envelope taped to it - give it to them without a roll! That experimentation and creative play should be encouraged, and the dice left on the table to be used for the important stuff. Lots of game design goodness today, and a whole lot of thoughts to put in the game when the search rules are written out. You will see these come up in the game when we put out the beta, so you shall see these subjects again. In a way, these thoughts apply to many of the skill rolls in the game, so this is quite an important discussion, and gives the game a unique flavor (based on design). Hopefully, this makes you think about when you (as a a referee) call for a search roll, and supporting creative play. Look what came in the mail today. Yeah, take this as an official announcement of our fantasy rules. 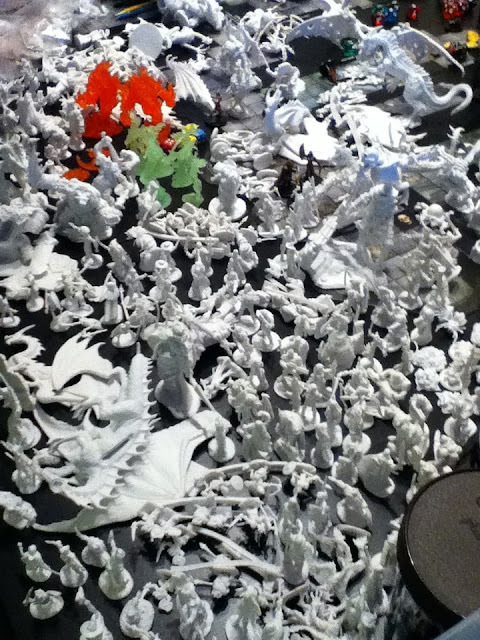 We will need a rules system to handle all of these, the ultimate BYOB miniatures fantasy roleplaying game. What better way to kick this off than with a 15-pound box of plastic figures. Yes, we are still counting.